The days of the 16th Century in which Jean-Baptiste Tavernier described the oysters of the Bahrain fisheries as often containing "as many as six or seven pearls" have sadly disappeared. Fine quality pearls grow ever rarer, not to mention strands of sixty-three perfectly matched natural pearls. The present necklace was assembled over a period of ten years by Raymond C. Yard, a discreet New York jeweller with irreproachably good taste. In 1929, it was sold to John D. Rockefeller. The strand is typical of Yard's selectivity. Not only is it perfectly graduated, but the colour of the pearls is uniform. To create such a necklace was no small feat as the discovery of oil and the subsequent pollution of the Persian Gulf's waters at the beginning of this century led to permanent damage of the oyster beds, diminishing the new supply of natural pearls. An idea of just how valuable these gemstones were at the time is reflected in the anecdote concerning the purchase of Cartier's current location in New York City. Pierre Cartier, founder of the firm's New York branch, which had opened in 1909, had been searching for a new location when in 1917 the Renaissance-style mansion of the banker Morton F. Plant, located at the corner of Fifth Avenue and 52nd Street, was pointed out to him. 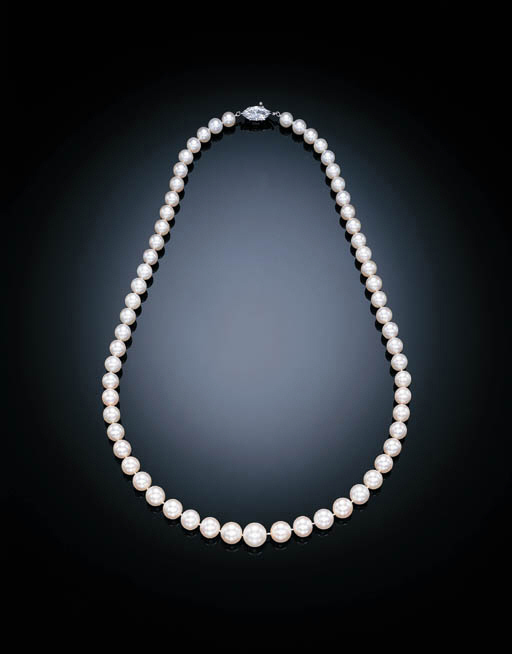 As the ever resourceful jeweller knew that Mrs Plant had admired a superb twin-strand pearl necklace in his salon, he proposed to exchange it for the building, an offer which was accepted. The history of pearls is probably the oldest recorded of all gemstones. According to George Frederick Kunz and Charles Hugh Stevenson in "The Book of the Pearl", the ancient Chinese dictionary, the "Nh'ya", written thirty centuries ago, "speaks of them (pearls) as precious jewels found in the province of Shen-si on the western frontier." In the texts of most ancient cultures, pearls enjoy a highly important position, far above that of diamonds. Modern history has seen no decline in their esteem. Queen Elizabeth I of England was legendary in her love of pearls. The illustrated picture of "Diana Cecil, Countess of Oxford" attributed to William Larkin demonstrates how pearls embellished the aristocracy in Renaissance England. The present century has only seen their desirability increase as they are only extremely rarely produced in nature. Particularly impressive are the treasures of India where in Bombay, the best quality specimens were reserved for the Maharajahs. The Gaekwar of Baroda, for example, the most highly ranked of the Maharajahs, had a pearl carpet made in the early 1900s which measured an impressive 10 by 6 feet. The Rana of Dholpur earned the nickname of the "Prince of Pearls" due to his habit of greeting foreign guests wearing twelve strands of 12mm pearls as well as a choker of enormous pearls. The provenance of the present necklace speaks to its quality. Like the Maharajahs, the Rockefellers purchased only the best.